Our limited edition 2015 t-shirts are now available to buy online. Simply click “shop” on the link above to place your order. 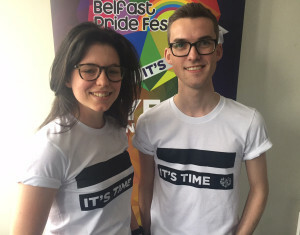 They will also be available to buy on Pride day within Custom House Square, but be quick as numbers are limited! PreviousPrevious post:Belfast Pride 2016 – Dates!NextNext post:Theme for 2015! Register to Vote – Make your voice heard! Get your Events listed now! The Official Belfast Pride Guide! Copyright © Belfast Pride 1991 to 2018 - All Rights Reserved.